Our napkin holders are hand-made by Tom's father, using pieces of end grain wood with the bark on and wooden dowels. They are sealed with a wood finish for many years of use. The bottom of the napkin holder has an attached soft rubber mat to prevent marking surfaces and keep it from sliding. Each piece looks a little bit different because it is completely made by hand, and will make a unique and beautiful addition to your kitchen. These holders are hand-made by Tom's father. They will hold CDs, DVDs, letters, etc. They are a half-section of bark-on board with dowels posted around the perimeter of the board. Each piece looks a little bit different because it is completely made by hand. These handcrafted hardwood pieces are finished with a clear sealer to bring out the wood grain. 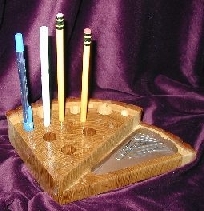 These Pen and Pencil Holders are hand-made by Tom's father. 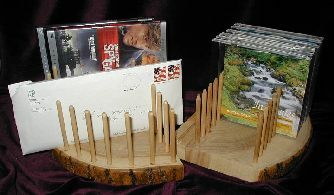 They are created from sections of bark-on board, with different size holes for pens and markers with a scooped out section for paper clips. Each piece looks a little bit different because it is completely made by hand. 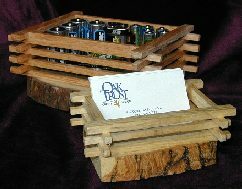 These holders are finished with a clear sealer to bring out the natural beauty of the wood. 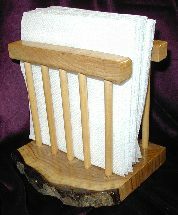 These square or rectanglar baskets are hand-made by Tom's father. They are created from sections of bark-on board, with different pieces of hardwood for the sides. They can be used for a jewelry holder, card holder, or for other odds and ends. Each piece looks a little bit different because it is completely made by hand. These handcrafted hardwood pieces are finished with a clear sealer to bring out the natural beauty of the wood.